Pre-Kindergarten’s first Design Challenge was inspired by the picture book, Not a Box, written by Antoinette Portis. The main character in the story is a rabbit with a box. Each time the reader asks the rabbit what he is doing with his box, the rabbit replies, “It’s not a box!” Instead, the rabbit imagines that the box is a pirate ship or a mountain – the possibilities are endless! And so we asked our Pre-Kindergarteners, “What would you make with just one box?” First, we explored different boxes to generate ideas, and then we sketched our plans on blueprints. Next, we headed to the Maker Space to construct our “not-a-boxes”! 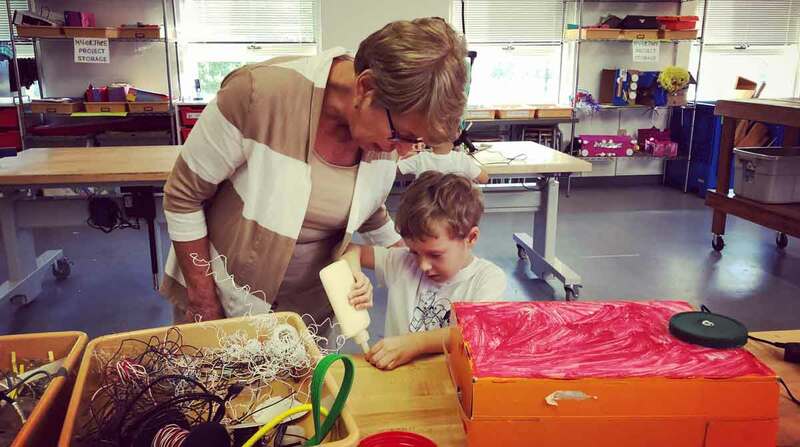 In the Makerspace, our littlest learners tinkered with loose parts, selected materials to be added to their boxes, tested ideas, and even made revisions–if and when ideas didn’t quite work out the way we expected. From race cars to robots…our Pre-Kindergarteners have shown us that a box will go as far as our imaginations take us! Be sure to check out our “not-a-boxes” on display in the Lindsey Library.